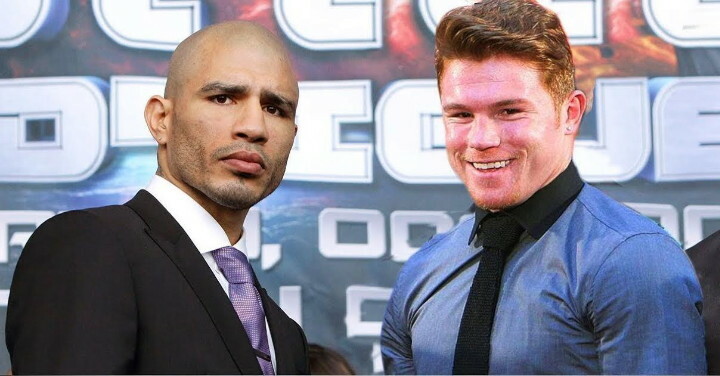 By Dan Ambrose: WBC middleweight champion Miguel Cotto (40-4, 33 KOs) and 25-year-old former IBF/WBC junior middleweight champion Saul “Canelo” Alvarez (45-1-1, 32 KOs) are both going to make a ton of money for their November 21st fight on HBO pay-per-view from the Mandalay Bay Resort & Casino in Las Vegas, Nevada. The 34-year-old Cotto, who promotes himself, will be making $30 million, according to elnuevodiario. For his part, Canelo will be getting $10 million plus for the fight, which will easily be the biggest payday of his career. This is big money for a couple of guys who aren’t considered to be the No.1 fighters in the 160lb division. Canelo is considered as the No.2 fighter in the 154lb division right now behind Floyd Mayweather Jr., even though Canelo hasn’t fought at junior middleweight for two years since his one-sided 12 round decision loss to Mayweather in 2013. Cotto is seen by many boxing fans as the No.2 fighter in the 160lb division, behind IBO/WBA middleweight champion Gennady Golovkin. Ring Magazine has Cotto as their Ring champion, but that’s an organization and equal to the massive amounts of fans who simply see Golovkin as a better fighter than Cotto. The fans aren’t seeing it the way that Ring Magazine sees it with them figuring Cotto is the best because he beat former WBC champion Sergio Martinez. The fans saw the Cotto-Martinez fight and they observed how one of Martinez’s legs looked very wobbly from the moment the fight started. Because of that, Cotto doesn’t get a lot of credit from the fans for having beaten Martinez. The fans also wonder why Cotto hasn’t fought Golovkin all this time, because the Kazakhstan fighter has wanted to face Cotto for the past two years, and he’s had no luck in getting him inside the ring. Staging the fight at the Mandalay Bay Resort & Casino in Las Vegas, Nevada, was also a move that will pay off for Cotto. The kind of money that Cotto is making for the Canelo fight is similar to the money that Mayweather has been making in some of his fights in his Showtime/CBS contract. What remains to be seen is whether the Cotto vs. Canelo fight will bring in 1 million pay-per-view buys or more. If it does, then you can expect these two fighters to wind up making even more than what was originally expected. Certainly, the fight will sell out the Mandalay Bay Resort in no time flat. It’s no question the fight will be a sellout. The only real question is how many PPV buys the fight will bring in. With the way that Canelo’s promoter Oscar De La Hoya of Golden Boy Promotions is talking, the fight will bring in a huge number of PPV buys. De La Hoyta hasn’t made a prediction yet for how many buys he thinks it will be bringing in, but with him talking about it breaking records, he must be assuming that it’s going to bring in more than 4 million buys. Why else would De La Hoya be talking about it breaking records? Of course, no one in their right mind actually believes the Cotto-Canelo fight will get anywhere close to the number of buys that the Floyd Mayweather Jr. vs. Manny Pacquiao fight brought in last May. That was a huge fight. Cotto-Canelo is more of a fight between a second fiddle in the middleweight division in Miguel Cotto and a fighter still trying to rebuild his career in Canelo Alvarez. As I said before, Cotto isn’t seen as the No.1 guy in the middleweight division right now. Golovkin is the No.1 guy. Cotto could have already shown that he was the No.1 fighter if he’d agreed to fight Golovkin and beaten him. But if Cotto had made that move he also could have likely been beaten to a pulp and knocked out by Golovkin. In that case, it would be very hard to sell a Cotto-Canelo fight to the boxing public, because the fans wouldn’t be able to shake the image of Cotto getting battered and beaten by Golovkin. There’s a negative and positive about Cotto not having faced Golovkin already. If he had, Cotto would have had the potential to make his fight against Canelo a much bigger affair if he were to beat Golovkin. But by playing it safe and not facing the Kazakhstan star, Cotto ensured that at least his fight with Canelo will be a money maker. If Cotto beats Canelo, which is doubtful, he could then face Golovkin and get another big payday. A lot of fans have serious doubts whether Cotto will do that. Many fans think Cotto will either offer Golovkin another step aside fee to have him step aside while he fights Canelo again, or he’ll vacate the WBC 160lb title if Golovkin and/or the WBC presses the issues and tries to force him to face Golovkin. I think it’s very likely that Golovkin won’t be getting a shot at the winner of the Cotto-Canelo fight, because I think they’re definitely going to face each other again in an immediate rematch, and possibly even face each other in three straight fights. Unless Golovkin is patient and willing to wait for the smoke to eventually clear between Cotto and Canleo’s fights, he may have to settle for having the WBC strip the Cotto-Canelo winner of the WBC 160lb title and given to Golovkin outside of the ring. At that point, I don’t think Cotto or Canelo will ever bother fighting him. They’ll eventually move on after they face each other 2-4 times, and fight whoever they want to in big money fights. Golovkin will have to be satisfied with beating IBF champion David Lemieux and then Tureano Johnson. There won’t be any big fights for Golovkin because there are really no big names for him to fight in the 160lb division. The only other top fighters in the middleweight division are Daniel Jacobs, Peter Quillin, and Andy Lee. Those guys aren’t going to fight Golovkin. « Will Pacquiao’s saltwater healing enable him to beat Khan?